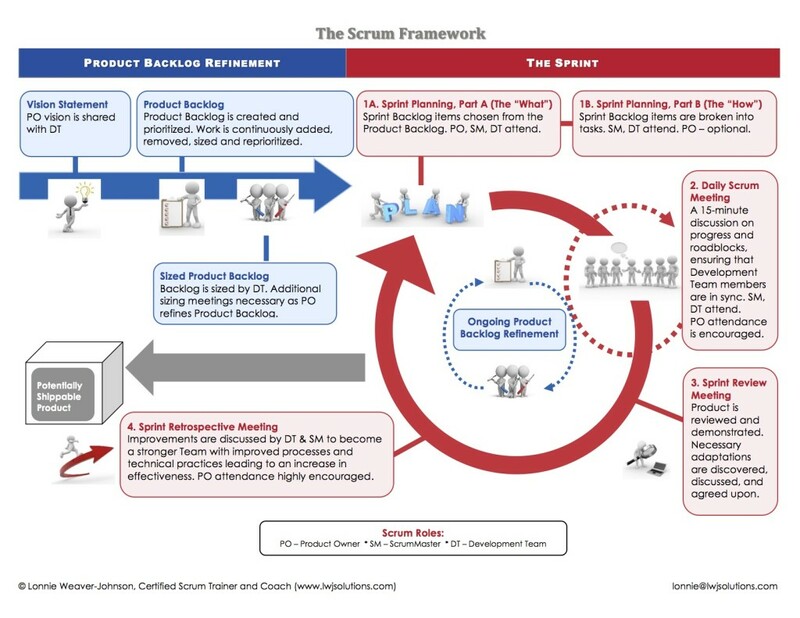 LWJ Solutions > What is Scrum? A Product Owner creates a prioritized list of work items called a Product Backlog. The Team plans a work cycle by pulling a small amount of items off that list and decides how to get that work done. The Team has a short amount of time (1 – 4 weeks) to complete the work. This time is called a Sprint. The Team meets very briefly each day to assess its progress (called a Daily Scrum). Along the way, the ScrumMaster keeps the team focused on its goal and the Product Owner keeps the Product Backlog prepped for the team. At the end of the Sprint the work should be potentially shippable, meaning ready to deliver to the customer. The Sprint ends with a Sprint Review (demo the product) and Retrospective (discuss ways to be better). As the next Sprint begins, the team chooses more work from the Product Backlog while at the same time they focus on their most important improvement areas.